Figure 13.1. Risk of progression based the presence or absence of an abnormal κ/λ sFLC ratio. Figure 13.2. Effect of increasingly abnormal κ/λ sFLC ratios on the relative risk of progression of MGUS. (This research was originally published in Blood© the American Society of Hematology). Figure 13.3. Risk of progression to myeloma or related condition in 1148 patients with MGUS. Rajkumar et al. measured sFLCs in serum samples from 1148 MGUS patients at diagnosis by using archived (frozen) sera that had been collected from the original Minnesota cohort of 1384 patients . An abnormal κ/λ sFLC ratio (<0.26 or >1.65) was detected in 379 (33%) cases at diagnosis. At a median follow-up of 15 years, malignant progression to MM or a related condition had occurred in 87 (7.6%) patients. The risk of progression in patients with abnormal sFLC κ/λ ratios was significantly higher (hazard ratio [HR] 2.6) than in patients with normal ratios, and was independent of the size and type of the monoclonal protein (Figure 13.1.). Furthermore, the risk of progression increased as κ/λ ratios became more extreme (Figure 13.2). The prognostic value of baseline sFLC measurements has been validated in a number of other studies . For example, in a retrospective study Turesson et al. monitored 728 Swedish MGUS patients for up to 30 years (median 10 years). During this time, 84 patients developed a lymphoid disorder, with MM accounting for the majority (53/84) of cases. 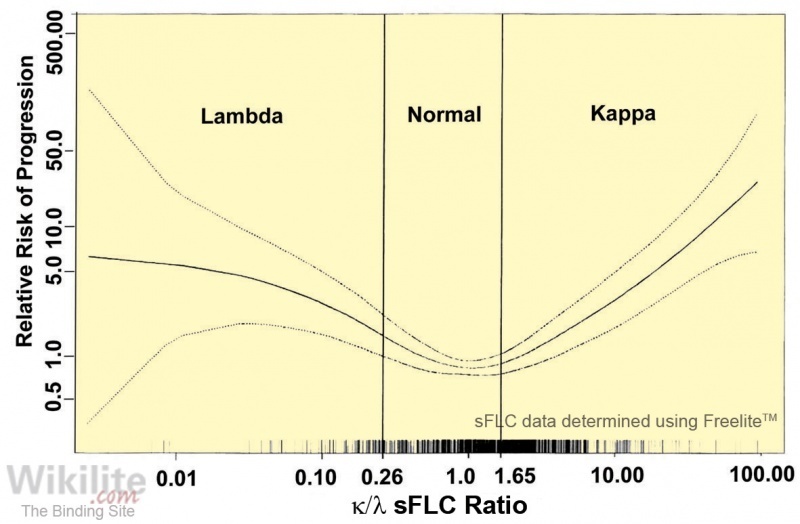 The κ/λ sFLC ratio was abnormal in 47% of the study population at baseline. Three risk factors were significantly associated with progression: an abnormal κ/λ sFLC ratio, monoclonal protein concentration (>15 g/L) and a reduction of one or two uninvolved immunoglobulin isotypes (immunoparesis). No association was found between the monoclonal protein isotype and risk of progression, which is in contrast to some previous reports , but in keeping with those of the Spanish PETHEMA group  and a large Czech study . The Spanish group also previously identified immunoparesis as a significant risk factor for MGUS progression in univariate but not multivariate analysis . In the study of Hajek et al. , 1887 Czech MGUS patients were monitored for up to 35 years (median 4 years). A total of 43.4% of patients had an abnormal κ/λ sFLC ratio at diagnosis, and, consistent with other studies, these patients were at increased risk of progression compared to those with a normal ratio (HR = 3.26). Rajkumar et al. constructed an MGUS risk-stratification model based on the size and type of monoclonal protein, and the presence of an abnormal κ/λ sFLC ratio at diagnosis (Table 13.2 and Figure 13.3). Using this model, low-risk patients were characterised as those with a small (<15 g/L) IgG monoclonal protein and a normal sFLC ratio. Such patients had a 2% absolute risk of disease progression at 20 years when competing causes of death were taken into account. Importantly, this low-risk group accounted for approximately 40% of the cohort. A smaller group of high-risk patients were identified as those with a large (>15 g/L) IgA or IgM monoclonal protein and an abnormal sFLC ratio. These patients had a 27% absolute risk of progression at 20 years. An alternate risk-stratification model was suggested by Hajek et al. based on the sFLC ratio, M-protein size, haemoglobin concentration and the presence of immunoparesis at baseline. * Accounting for death as a competing risk. 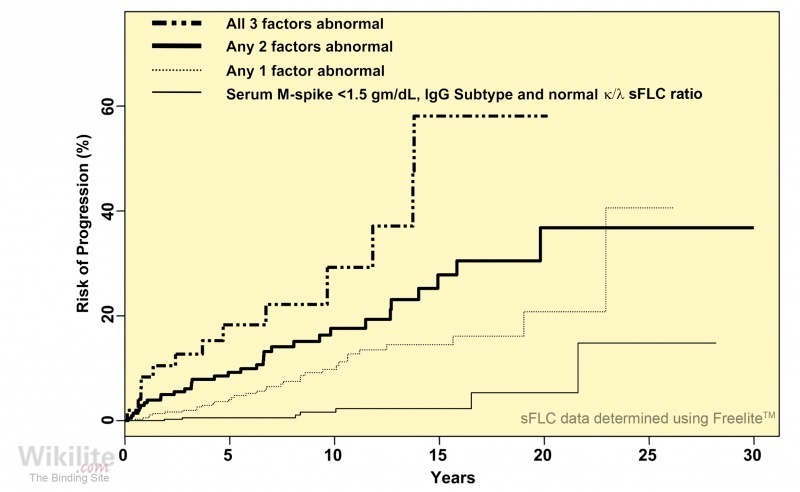 The three risk factors are defined as an abnormal κ/λ sFLC ratio (<0.26 or >1.65), a high serum monoclonal protein concentration (>15 g/L), and a non–IgG subtype (IgA or IgM). Table 13.2. Risk stratification model to predict progression of MGUS . Other risk factors to identify MGUS patients at highest risk of malignant progression have been suggested by a number of other groups. Cesana et al. reported that at MGUS diagnosis, a bone marrow plasma cell (BMPC) percentage of 6 – 9% carried twice the risk of MGUS progression compared with ≤5% BMPCs. Perez-Persona et al. characterised the phenotype of BMPCs in 407 MGUS patients using multiparameteric flow cytometry. Aberrant plasma cells (aPC) were defined by the absence of CD19 and/or CD45, decreased expression of CD38, and overexpression of CD56. Using multivariate analysis, ≥95% aPC/total BMPCs, together with DNA aneuploidy, identified MGUS patients with the highest risk of progression . The presence of urinary Bence Jones protein (uBJP, monoclonal FLCs) was highlighted as risk factor in several, but not all studies (Table 13.1). In part, this may be related to the problems obtaining a urine sample (Chapter 24). For example, in the study of 1384 MGUS patients by Kyle et al. urine data was unavailable for 70% of patients, and the presence of uBJP failed to reach statistical significance. 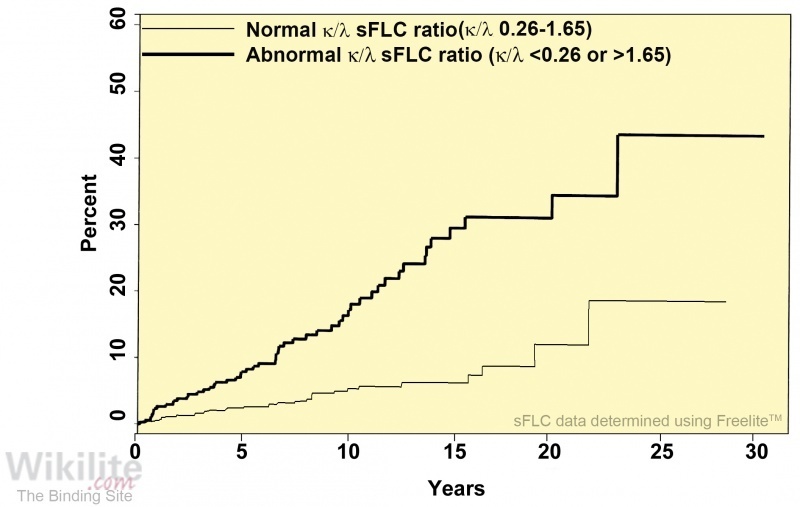 Since the introduction of sFLC assays into routine practice, the κ/λ sFLC ratio has been identified as a more reliable prognostic marker than uBJP. IMWG guidelines  recommend that patients with MGUS should be risk stratified at diagnosis to optimise counselling and follow-up, using the risk-stratification model outlined in Table 13.2 (see Section 25.3.2, Table 25.3). For patients with low-risk MGUS, follow-up is recommended at 6 months initially and, if stable, every 2 - 3 years or when symptoms suggest evidence of a plasma cell malignancy. For these patients, a baseline bone marrow examination or skeletal radiography is not routinely indicated. For patients with intermediate- and high-risk MGUS, follow-up is recommended at 6 months initially, then annually and/or upon any change in the patient's clinical condition. A bone marrow aspirate and biopsy should also be carried out at baseline to rule out any underlying plasma cell malignancy . In future, additional markers may be added to risk stratification models to better define high-risk patients. Rawstron et al. have recently showed that plasma cell phenotype (CD138/38/45 expression) and sFLCs provide independent and complementary prognostic information on the risk of progression. The use of additional genetic risk factors (including light chain gene rearrangements  and gene expression profiles ) are currently being investigated.